EXPOSURE & RESPONSE PREVENTION (ERP) SCHOOL IS HERE! "It's a Beautiful Day to Do Hard Things!" ERP School is a complete online course that teaches how to apply Exposure & Response Prevention (ERP) to your Obsessions and Compulsions. 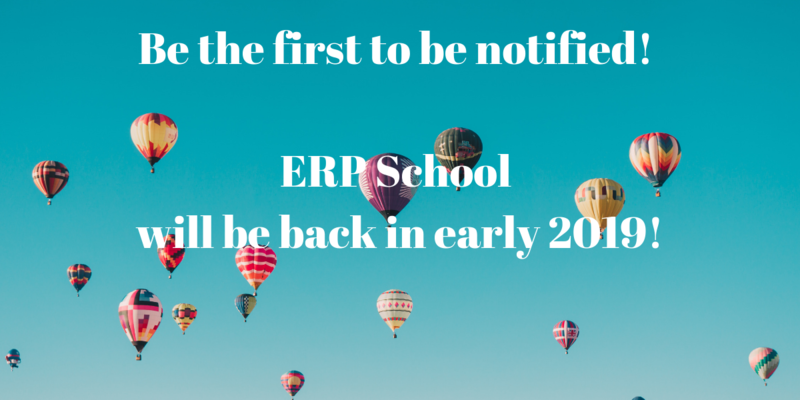 ERP SCHOOL WILL BE AVAILABLE AGAIN IN LATE 2019! CLICK BELOW TO SIGN UP TO BE ON THE WAITLIST! What Does the ERP School Course Cover? How much does ERP School Cost? We like to keep the courses super affordable so that everyone gets a chance to learn the tools needed to manage anxiety, obsessions and compulsions. Please note the ERP School's price will be going up next time we offer the course, so jump in now while the price is SO GOOD! Will you cover my specific type of obsessions and compulsions? The course addresses almost all of the most common themes of Anxiety and Obsessive Compulsive Disorder. There are worksheets and example worksheets for many of the sub-types. If your specific obsession or theme was not covered, there are directions on how to make it specific for your situation. If you still have questions, Kimberley provides a 50 min live chat every second and fourth Monday at 12pm on the CBT School Campus FB Group to answer any questions you have. What is included with ERP School? Exposure & Response Prevention (ERP) School includes 18 video's, supplemental PDF's and Handouts to help you apply the content to your obsessions and compulsions and a BONUS 6 videos on applying ERP to the common OCD Sub-types. In total, the course is almost 5 hours of the same ERP information and skills I teach my face-to-face clients. CBT School is committed to supporting you throughout this process. If you have any questions, Kimberley meets bi-monthly on Facebook and Instagram for her LIVE MAGIC MONDAY Q&A hour (every second and fourth Monday at 12pm PDT) where she answers questions and troubleshoots any concerns you may have. Once you have purchased the course, you will have unlimited access to the videos. When is ERP School Available? Exposure & Response Prevention (OCD) School is available for purchase just a few times per year. The cart for ERP School will open again sometimes in Late 2019 so get excited! Sign up to be on the waitlist and be the first to know when ERP School will be available again. You will also and get special offers! "Kimberley is simply wonderful and knows anxiety/OCD like the back of her hand." " Kimberley Quinlan is obviously very dedicated to helping those suffering with anxiety in a way I have not experienced before"
"Kimberley manages to make me feel as though she is talking directly to me and has a kind, understanding and reassuring tone that I appreciate so much"
IT IS A BEAUTIFUL DAY TO DO HARD THINGS! I LOVE CBT School and I would LOVE to receive exclusive updates on upcoming events, direct links to new podcast episodes & bonus materials.